Alzheimer’s is estimated to affect one in two persons over the age of 80 and is being diagnosed in people as young as 50. Seeking comfort in the solace of words, Hughes put out a call for poems and short prose about Alzheimer’s. Over 500 people responded — doctors, nurses, social workers, hospice workers, daughters, sons, wives, and husbands whose lives have been touched by the disease. From this, she chose work from 100 writers to create Beyond Forgetting: Poetry & Prose about Alzheimer’s Disease, a moving account of a dreadful disease. Oregon-based writers Kake Huck, Drew Myron and Mark Thalman will share their work as part of Off the Page, a reading event on Saturday, April 25 at 7pm at the Green Salmon Coffeehouse in Yachats, Oregon. The event is free. “In our culture, we often talk about dementia only in the abstract, as a label, not in all its bittersweet concreteness,” notes Hughes, who teaches at Edmonds Community College in Lynnwood, Washington. 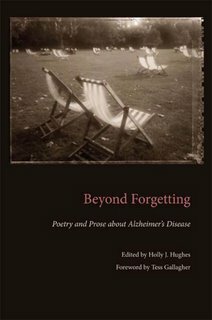 Through the transformative power of poetry, the book seeks to move "beyond forgetting," beyond the stereotypical portrayal of Alzheimer's disease to honor and affirm the dignity of those afflicted. With a moving foreword by poet Tess Gallagher, the anthology forms a richly textured, literary portrait encompassing the full range of the experience of caring for someone with Alzheimer’s. “For the many people now trying to cope with a loved one suffering from this tragic disease,” says Hughes “I hope this collection will provide solace." Beyond Forgetting is published by Kent State University Press, and is available at www.beyondforgettingbook.com.